A clean truck means a clean public image on the roads and yet trucks can be a hassle to wash. But not at IPT! 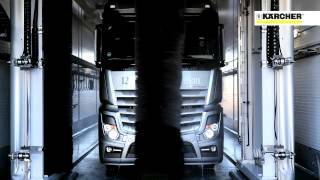 A true innovator, IPT has introduced the first Automatic Truck Wash Center in the entire Middle East. This revolutionary system is at our Amchit highway station. Save money, time, and effort with this one-of-a-kind solution. To make things even easier for you, we offer you the flexibility to choose brush, high pressure touch-free wash, and steam cleaning for any truck (up to 4.2 meters) in less than 20 minutes. Enjoy impressive cleaning results thanks to IPT’s collaboration with the renowned German brand, KÄRCHER, a worldwide leader in providing advanced and professional cleaning solutions. And because we sincerely care about the environment, IPT’s Automatic Truck Wash Center has an effective water recycling system that saves up to 85% of the water used.